The Supermarine Spitfire is one of the most famous aircraft of World War two, but continued in service for many years after, both as a front line fighter and in secondary roles. It was built in greater numbers than any other British aircraft, and was the only Allied fighter to remain in production throughout the war. Designed by RJ Mitchell, the aircraft’s famous elliptical wing had a thin cross-section to promote high speed, which endowed a higher top speed than its compatriot the Hurricane, and many of its adversaries. During the Battle of Britain there was a public perception that the Spitfire was the main RAF fighter when in fact the more numerous Hurricane carried out the most missions. After the Battle of Britain the Spitfire became the backbone of RAF Fighter Command and saw service in all theatres of the war, in several roles including interceptor, photo-reconnaissance, fighter-bomber, carrier-based fighter and trainer. Over 20,000 examples were built in many different variants, with two different types of engine and several wing configurations. We offer four titles covering flight manuals (called Pilot’s Notes by the RAF) for most models of this famous aircraft, including the naval Seafire variant. We also have one Servicing and Descriptive Handbook. Each title is US$9.95. 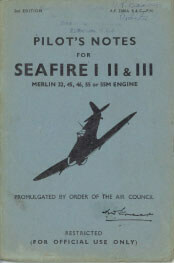 RAF Pilot’s Notes for the Seafire I, II and III, AP 2280A,B,C-PN 2nd Edition dated June 1944, with approx 36 pages. 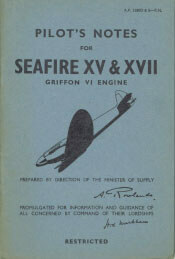 RAF Pilot’s Notes for the Seafire XV and XVII, AP 2280D & E-PN dated November 1946, with approx 43 pages. 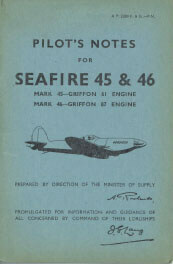 RAF Pilot’s Notes for the Seafire 45 and 46, AP 2280F & G-PN dated April 1948, with approx 43 pages. 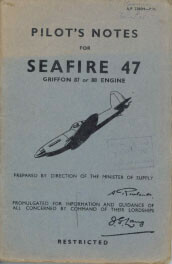 RAF Pilot’s Notes for the Seafire 47, AP 2280H-PN dated November 1947, with approx 43 pages. 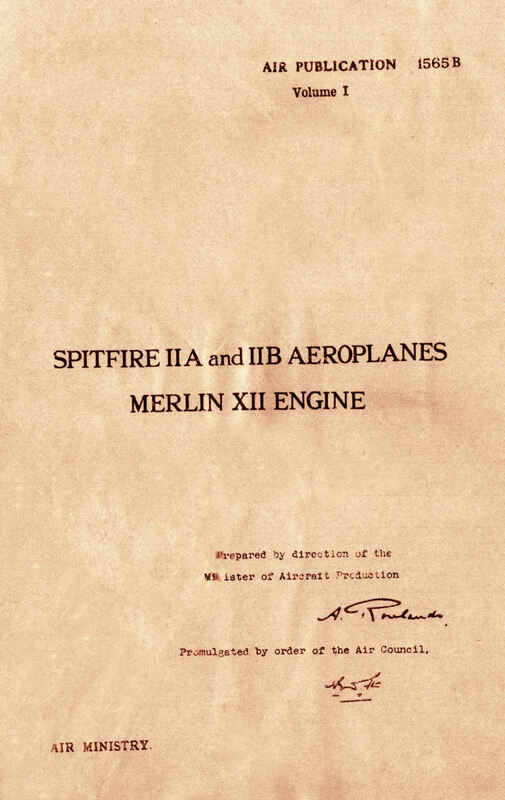 RAF Pilot’s Notes for the Spitfire IIA and IIB, AP 1565B-PN dated July 1940, with approx 60 pages. 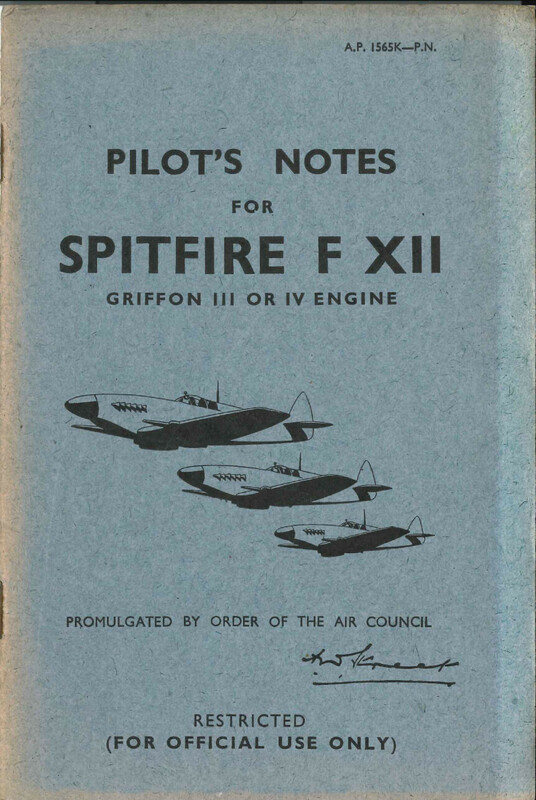 RAF Pilot’s Notes for the Spitfire VA, VB, VC, Seafire IB, IIC and III, AP 1565E-PN and AP 2280A,B,C-PB dated May 1941, with approx 50 pages. 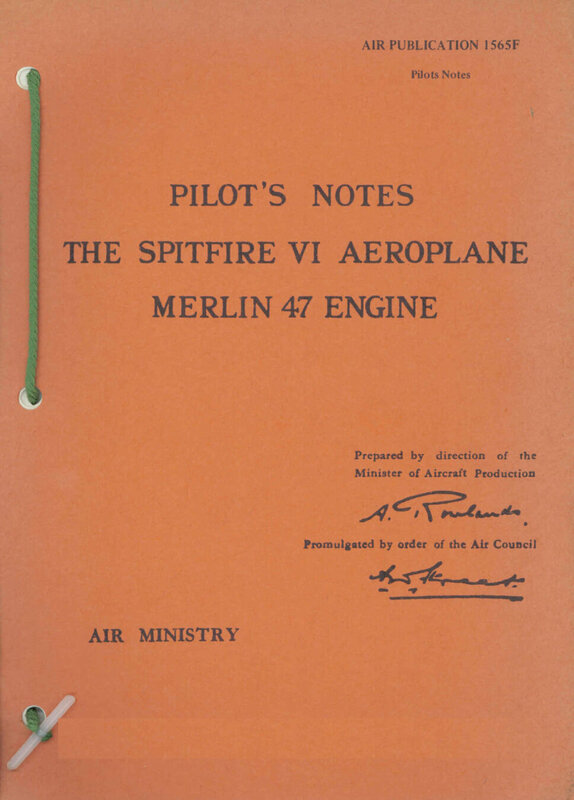 RAF Pilot’s Notes for the Spitfire VI, AP 1565F-PN dated January 1942, with approx 40 pages. RAF Volume One (Servicing and Descriptive Handbook) for the Spitfire IIA and IIB, AP 1565B Volume One dated July 1940, with approx 257 pages. 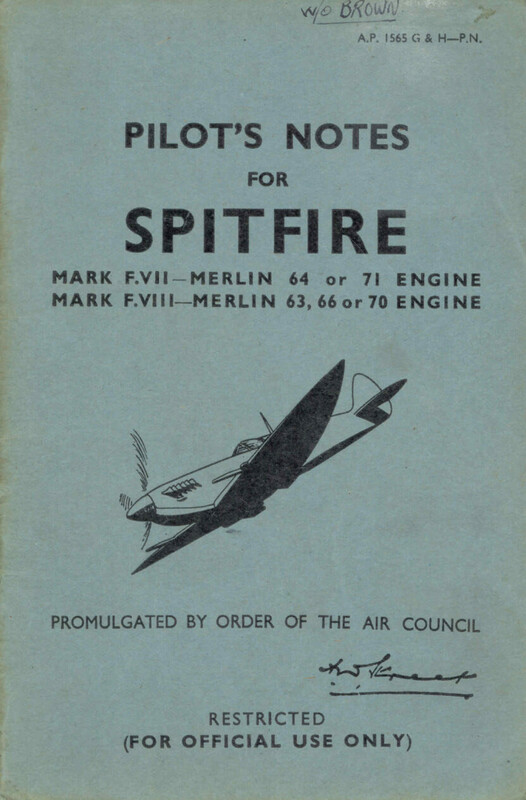 RAF Pilot’s Notes for the Spitfire VII and VIII, AP 1565G and H-PN dated December 1943, with approx 36 pages. 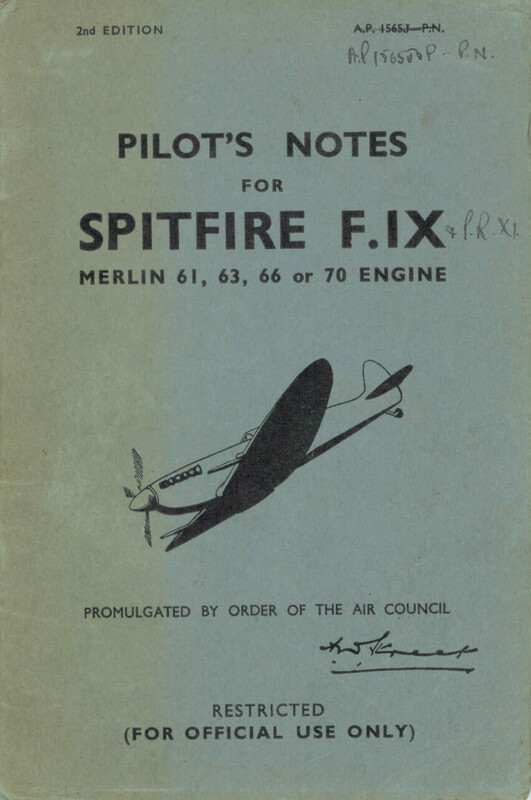 RAF Pilot’s Notes for the Spitfire IX (and PRXI), AP 1565J and P-PN 2nd Edition dated August 1943, with approx 30 pages. 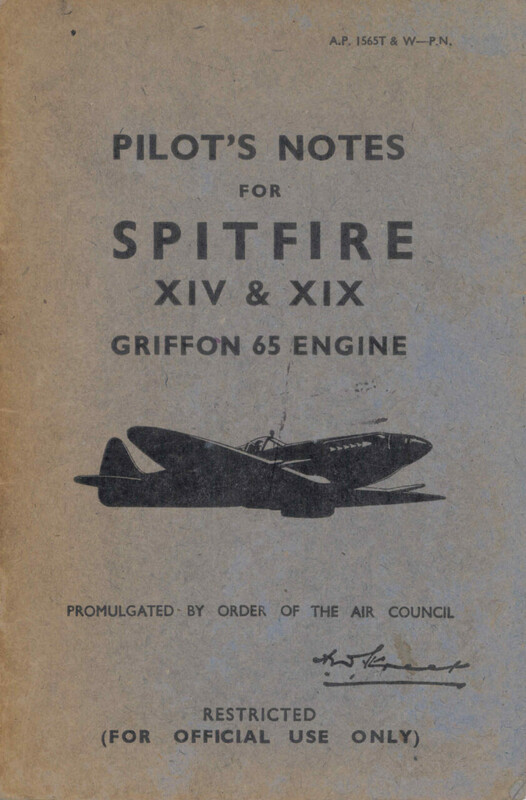 RAF Pilot’s Notes for the Spitfire XII, AP 1565K-PN dated November 1943, with approx 27 pages. RAF Pilot’s Notes for the Spitfire XIV and XIX, AP 1565T and W-PN dated April 1944, with approx 34 pages. 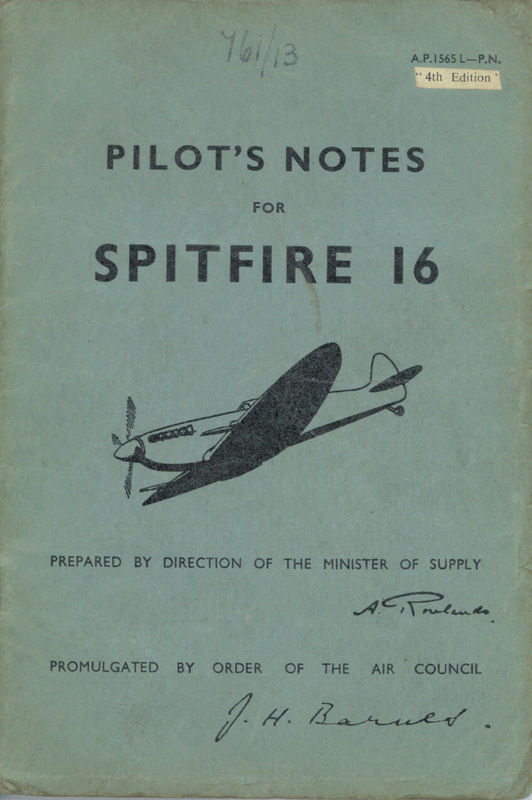 RAF Pilot’s Notes for the Spitfire 16, AP 1565L-PN 4th Edition dated August 1949, with approx 39 pages. 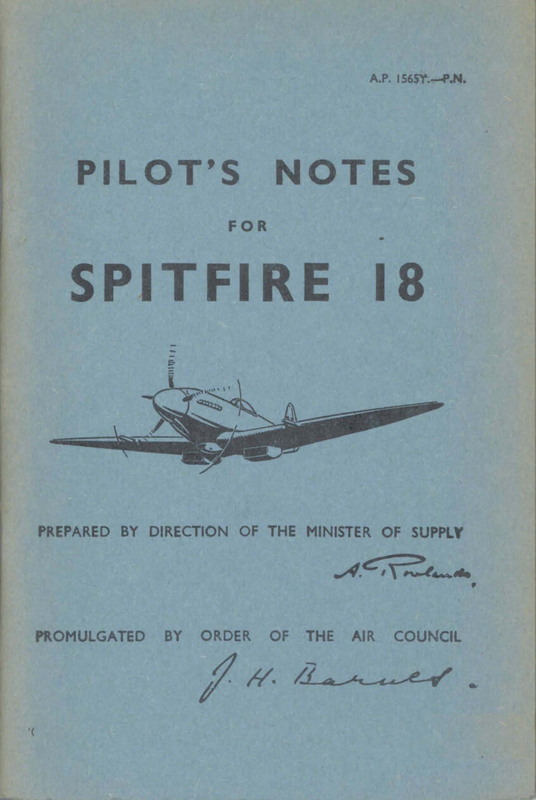 RAF Pilot’s Notes for the Spitfire 18, AP 1565Y-PN dated January 1950, with approx 43 pages. 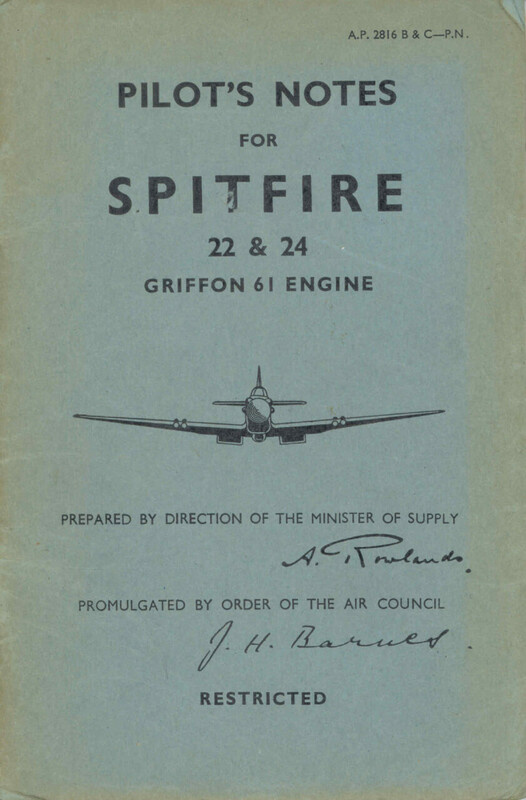 RAF Pilot’s Notes for the Spitfire 21, AP 2816A-PN dated December 1948, with approx 43 pages. 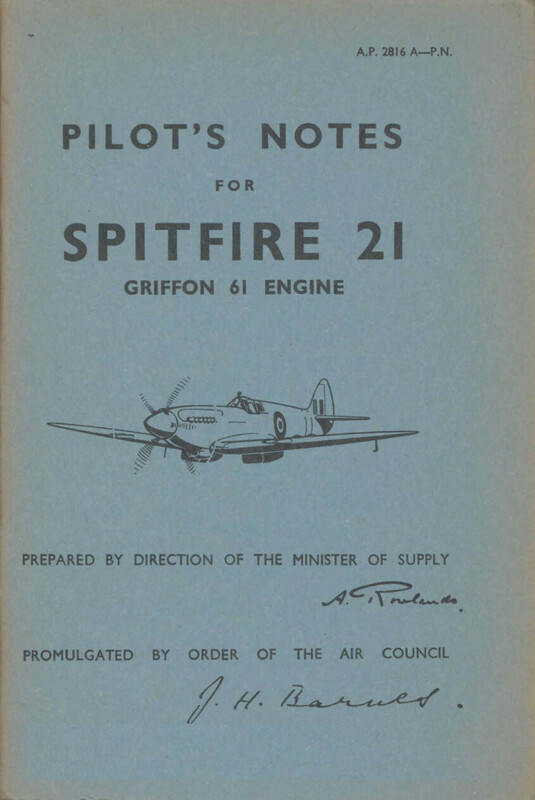 RAF Pilot’s Notes for the Spitfire 22 and 24, AP 2816B and C-PN dated September 1947, with approx 42 pages. 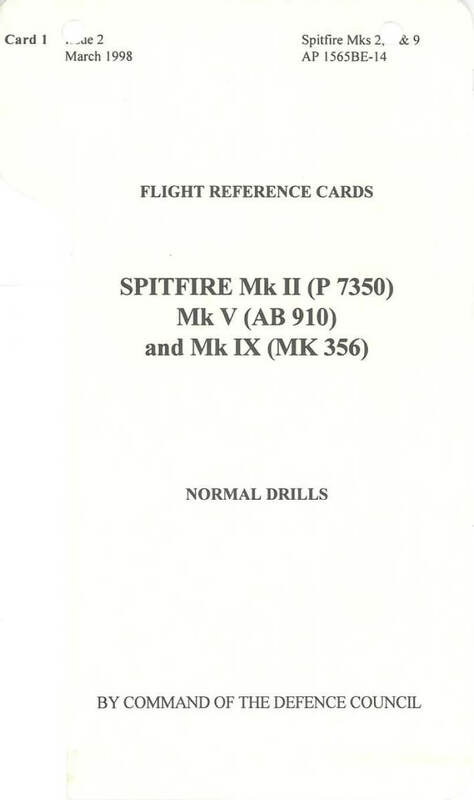 RAF (Historic Flight) Flight Reference cards for the Spitfire Mk II (P7350), Mk V (AB910) and Mk IX (MK356), AP 1565BE-14 Issue 2 dated March 1998 with approx 22 pages.